Three Powerful Stories. Three Edge of Your Seat Thrillers. Three Books for Half the Regular Price. Murder is a Tricky Business (Book 1) -Thereâ€™s a secret, that much is certain, but who knows? The missing actress? The executive producer, his eavesdropping assistant? Or the actor who portrayed her fictional brother on the Soap Opera? Why has DCI Cook been taken away from more important crimes to search for the woman? Itâ€™s not the first time sheâ€™s gone missing, and why does everyone assume sheâ€™s been murdered? Murder House (Book 2) - A corpse in the fireplace of an old house. It's been there for thirty years, but who is it? It's clearly murder, and what connection does the body have to the previous owners of the house? It was bound to be discovered eventually but was that what the murderer wanted? The main suspects are all old and dying, or already dead. There's a motive, but what is it? Those who know are not talking out of an old-fashioned belief in that a family's dirty laundry is not to be aired in public, and certainly not to a policeman - even if that means the murderer is never brought to justice! 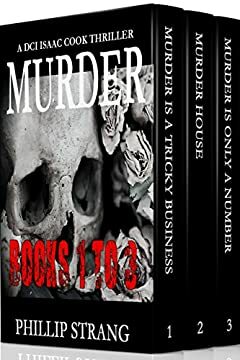 Murder is Only a Number (Book 3) - Before she left she carved a number in blood on his chest. But why the number 2, if this was her first murder? And why is she keeping count? The woman prowls London. She kills at will. Her targets are men who have wronged her, or have they? DCI Cook knows who she is, at least after she has killed the first four, but the woman disappears in plain sight. The pressureâ€™s on to stop her, but sheâ€™s always one step ahead.